Our high-grade Power Distribution Units are engineered with Type 3R construction standard in compliance with NEMA, JIC, NEC, UL and other industry standards to ensure industry regulatory approval. The power distribution unit includes a padlock hasp, beneficial for safety and compliance. Enclosures built with 12-gauge cold rolled steel construction protect electrical and wiring and ensure safety while in proximity to large machinery. Loss of power is unacceptable in many mission-critical operations. 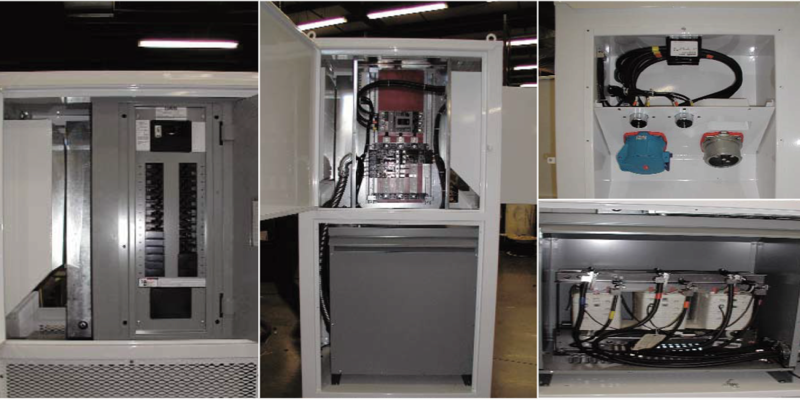 The Portable Distribution Units are built with all internal wiring and stacked within a tall and lean durable design including wiring connection to the receptacle. For high heat on the job site, the unit includes an integral transformer fan with thermostat for the high ambient temperature to cool down. Custom power configurations are taken into consideration when engineered for optimal power distribution on your specific job site. Having extensive international experience, Denver-based Easter Owens offers over 60 years of metal fabrication experience and services. Specializing in power distribution equipment, custom metal buildings, industrial control panels, electrical enclosures, and security electronics, Easter-Owens prides itself on providing high-quality material, along with personal customer service. Have Questions About Power Distribution Units? Contact Easter-Owens with to speak with a representative or to request a quote on your next power distribution project.